You can’t have a family friendly event without making sure there are plenty of activities for the hunters of the future! The Oregon Waterfowl Festival is not just for adults. 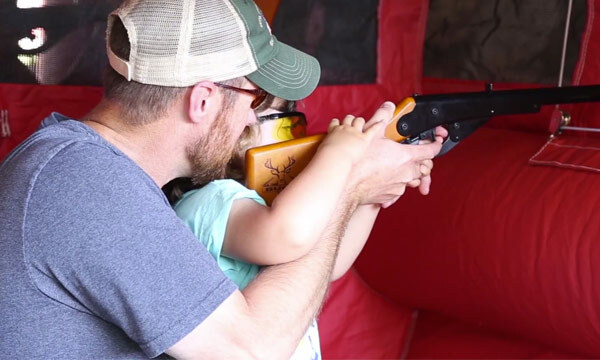 We work hard every year to make sure that the event is family friendly and has enough activities for the youth that are so important to the future of hunting.So bring your kids, grandkids, or the whole family and get ready for some fun. It’s not an Oregon Waterfowl Festival kidsville without one of the most popular events, WADER RACES! Suit your youngsters up in adult waders and root them on as they race their friends. Winners will be entered into a drawing to win some great prizes. We will draw the winners at the Hevi-Shot BBQ Saturday evening. Kids under 14 are eligible. Must be present to win. Some of the wildest looking ducks are spotted at the festival each year. A few species seen are the Green-Wing Mallard, PinWidge, Woody Teal, and the vary rare Redheaded Spoony. While you will probably never see any of these in the duck blind this fall, these decoys are sure to become an important addition to your spread. Free to all participants. Must be present to win. More fun than an unexpected flock of “Buzzing Teal”, for the kids that is. Always one of the main attractions for the little ones. Does your kid want to call like the pros? Give them a chance to compete in the youth calling contest and they can come home with some prizes. ODHA generously pays for every youth competitors entry fees.